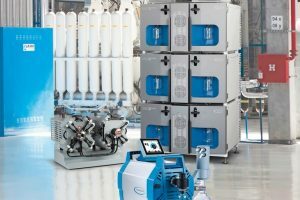 Aerzener has developed the AT Turbo blower Generation 5 especially for the requirements of biologically working municipal and industrial water treatment plants. This series is available in 11 sizes and with suction volumes of approx. 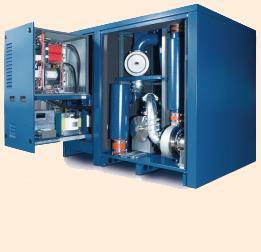 4000 up to 13 200 m³/h, pressure ranges of 400 up to 100 mbar and motor sizes up to 300 kW. 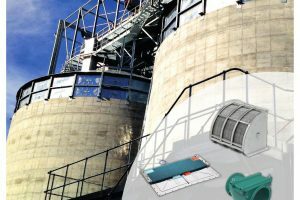 The turbo blowers are equipped with high-speed permanent magnet motors and can be adapted optimally to changing need of process air via frequency converter and without additional mechanical adjustments even steplessly between 40 and 100 %. Frequency converter and smoothing coil are integrated in the plants fully wired. Compared to conventional motors this motor achieves a much higher efficiency ratio. 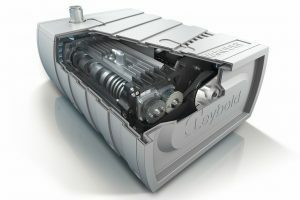 The air-cooled compact motor is speed controlled. The drive is effected via an absolutely oil-free as well as touch- and vibration-free air-pocket bearing.